Whilst New York is definitely regarded as somewhere I'd like to visit someday, it's not for the same reasons like most others want to. I'd love to visit the city, embrace the sights and sounds as much as the food but above everything else is I'd like to experience New York's answer to the West End, Broadway. Being a huge fan of the theatre there's something which excites me in experiencing theatre in other countries and is something I am keen to do more of in the upcoming years. In recent months I have drawn myself more and more to the soundtracks of some of Broadway's greatest masterpieces and crossing my fingers tightly that one day I'll see them or they'll come overseas to London. 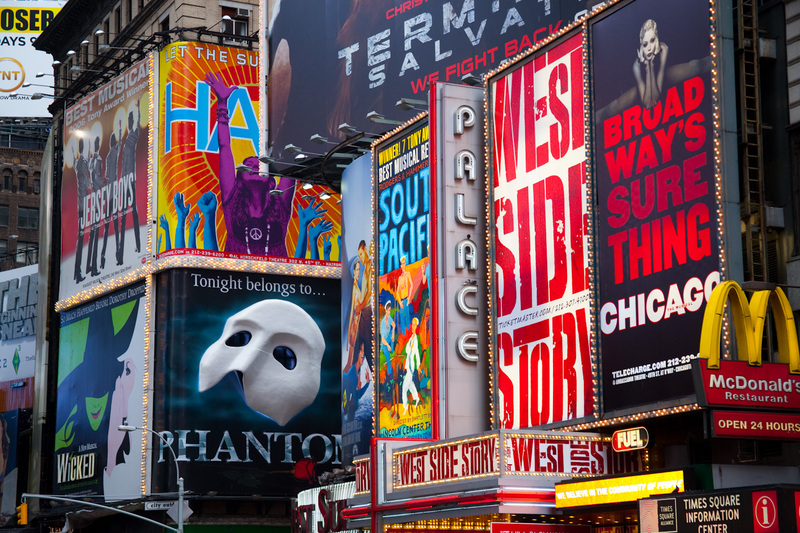 New York's Broadway is home to 41 professional theatres with 500 or more seats located in the Theater District and Lincoln Center along Broadway, in Midtown Manhattan. I'm always mesmerised by the sights of these incredible theatres and their posters taking centre stage of the streets of New York, so here in a little nugget of a blogpost is my 2017 Wishlist, the shows that I would absolutely love to travel and see. Kind of a new addition, the soundtrack is incredible and I have such an emotional attachment to it that it's normal for me to listen to it on a daily basis. It centres around title character Evan Hansen, a guy who has felt invisible all his life but when a tragic event shocks the community, trusting him into the centre of a rapidly evolving controversy, Evan is given the opportunity probably most of us wanted at some point: the chance to be somebody else. I think what's the most important thing about this production is it's relevance to a lot of individuals, it's great for young people to listen to and has a great understanding/sensitivity to mental health. I really hope eventually this production will make it's way overseas, the UK scene will absolutely love it. My favourites to sing out loud from the soundtrack are You Will Be Found and Waving Through The Window. This musical was brought to life by a all-female creative team, therefore a real vibe for girl power is here! The original music and lyrics come from Sara Bareilles (who has written some of my favourite songs of all time!). The musical is inspired by the film with the same name and tells the story of Jenna, who is a waitress as well as a expert pie maker. She dreams of life beyond her small town and loveless marriage. With a baking contest in her nearby county and even a new doctor in town, maybe there's a chance for this new start, whilst her fellow waitresses offer their own recipes for happiness. It's about how Jenna must summon the strength and courage to rebuild her own life. I'm really enjoying She Used To Be Mine and You Matter To Me. The stage adaption of the very much loved 1997 animation film is now a hit on Broadway, capturing all the magic and beautiful score from the film. If you haven't seen the film before then it takes us back to 1920s Paris, as a brave young woman sets out on the adventure of her life; discovering the mystery of the past. She is being pursued by a ruthless Soviet officer who is determined to silence her, the young woman Anya enlists the aid of a dashing conman and a lovable ex-aristocrat. Together they embark on an epic adventure to help Anya to find her home, love and family. I love how true to the film their soundtrack is so will be excited in seeing how they've created this story on the big stage. Wicked is one of my favourite musicals ever so I'd love to see how it fesses up compared to the much loved and known London production. If you have been living under a rock then Wicked is the story of what happens between the Wicked Witch of the West and Glinda the Good before Dorothy comes to Oz. It's one of the best powerful musicals I have ever seen. I love it's easy to follow storyline, creative structure and it's incredible costume and set design. Defying Gravity and For Good will always remain to be my favourite musical songs of all time. Are there any Broadway musicals on your to see list?